Cambodian Prime Minister Hun Sen had a surprise Monday night during his visit to Japan when his Japanese counterpart Shinzo Abe celebrated his birthday with a cake and song. 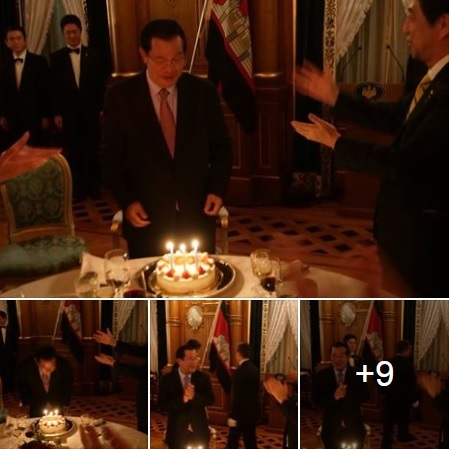 Hun Sen posted on Facebook that Abe, during a dinner he hosted in Tokyo, stood up and sang a birthday song while the cake was presented. The Cambodian leader's birthday is officially recorded as last Friday. Hun Sen, who is on a four-day official visit to Japan from Sunday, wrote that he was thankful to Abe for the birthday cake and golf set gift, saying he would never forget that moment. The two leaders held talks earlier in the day, with Abe pledging to expand his country's assistance to Cambodia in fields including infrastructure development.